"Made in America by Americans"
Why Choose to buy from HMC Industries? Why buy American Made by Americans? HMC designs and builds nearly all of our products in house. From our own GP-1 Rotary Pump to the Frames for our Air Lifts, we designed it and we build it. We will stand behind our products and provide you phone/email/personal support when you need it. We believe in America and have built this company to try and provide high quality American manufacturing jobs to Americans. Our labor averages over 25 years of experience in manufacturing. We don't have a lot of young kids working for us. Our labor employs expert welders, fabricators, machinists, and assemblers. They truly care about the products we ship as it's a reflection on their career and life standards. Our owner, Todd Wilson grew up in manufacturing. As a young child he learned to program CNC lathes before he was 16. He worked for his dad at Hollingsworth Mfg, bought that company in 1998 and still owns it today. Hollingsworth Mfg. has been around since before 1920 and has a reputation for manufacturing only the very best parts with precision and tight tolerances. Buying American Made Products means your dollars get reinvested in the U.S.A. We buy our steel, our parts, our fasteners, our tires, and our paint from other American suppliers. For instance; our GC-Series Tires are made by Roll Tech in Hickory, NC. Those tires are made from recycled rubber...which is both good for us, you, and our environment. We love to support non-profit charities that have a great cause. Soon we will be releasing a new section on our website called "Lifts for a Cause". We plan to donate several lifts every year to chosen charities for raffles and giveaways. What are our products and how are they used? HMC started with just one product; the GC-30 Gas Caddy. The Gas Caddy is a welded steel tank with an integrated rotary hand pump. It is designed to hold and transfer gasoline for service shops, acreage owners, military applications, lawn and garden shops, motorcycle shops, city depots, school building and grounds, and many other industries. The GC-30 holds 30 gallons of fuel and can be used to either transfer fuel from the tank or reclaim fuel from another source and transfer it into the gas caddy. The pump works in both directions simply by changing the rotation of the crank. HMC now manufactures more models of Gas Caddies than any other manufacturer in the world; including our GC-30G, GC-30B, GC-20R, GC-20G, GC-20B, GC-15R, & GC-15G. Our next development was our line of Oil Caddies; The OC-Series. These Oil Caddies utilize a similar 30 Gallon Welded Steel Tank, but incorporate a Lincoln Pneumatic Pump, Hose, & Digital Meter. They are a handy piece of equipment when shops need to dispense motor oil, hydraulic fluids, gear oil, transmission fluids, or industrial way oil for machine tools. The great advantage of using the OC-Series Oil Caddy, is that it is portable around the shop. You don't need to get your equipment up close to expensive oil distribution systems. Instead, simply fill the caddy from your bulk storage and wheel it over to wherever your equipment is, hook up an air line, and start transferring fluid...keeping close track of how much you've dispensed in Quarts, Litres, or Gallons. Hy-Pro Shop Tools was developed. Hy-Pro is our trademarked brand for high quality products that fit in our wheel house but are not necessarily 100% manufactured in the U.S. These are products which we are simply unable to produce in the U.S. at a price that the market will support. They aren't necessarily commodity items, but more likely to have significant competition from those Big Box retailers who tend to focus on imports instead of American Made. We try to maintain a balance between how many products we offer under the Hy-Pro brand and the products we manufacture domestically. Right now, there's only 2 products with the Hy-Pro brand on them, the FST-15R and the FST-15G. From 2013 through 2015, HMC was focused on our largest product development since inception....our new SL Series Air Lifts. 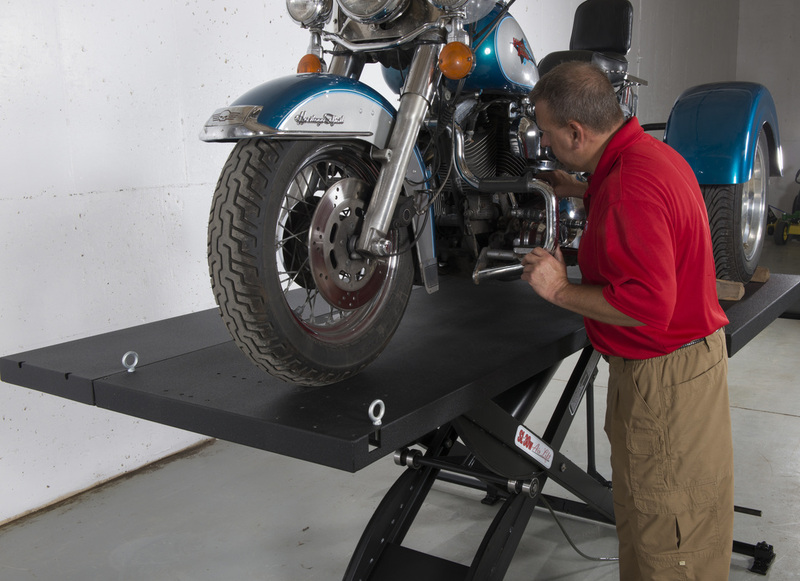 For what seems like forever, the ONLY choice consumers had for an American Made Motorycycle Lift was from Handy Industries, LLC. Their design and products were solid, but lacked current ingenuity and upgrades. HMC saw a need to bring a new style of lift with new features and standards more in line with the 21st century. It took over 2 years of research and development, but in the fall of 2015, we released our new line at the AIMExpo in Orlando, Florida. Our SL-Series air lifts incorporate common parts and assemblies which can be used across the spectrum of the SL line. The 6" Diameter x 27" Long Cylinder has an 1/8" wall, a CNC machined Piston and is used in the SL-24 & SL-30 air lifts. The frame and phenolic wheels are the same for both series. Both the SL-24 and SL-30 boasts a huge 1" Greasable pivot pin, both have a boxed in frame made from over 1/4" think C-Channel frame member. Under the top of the SL-24 and SL-30 you will find heavy gauge rectangular tubing supports which make our Lift Top the strongest in the industry. Another feature that sets us apart from a Handy Lift is how our Safety Detent Bar is mounted...you'll see it is mounted to the Frame, not the Top. This way we won't have that pesky problem of the top folding over when you load it up with the heaviest motorcycle or ATV you can find. ​​​​The SL-30W air lift table is truly a standard all to itself. The SL-30W utlizes HMC's very own Quad Extension Design. This design allows 1 of 4 Side Extensions to be removed idependently. You can take one out or all 4...but the best part is it only takes ONE of your service techs to do it...not TWO guys like a Handy or Other Lift requires. The Quad Extension Design also allows 4 wheeled vehicles to remain stable on the Lift Table. 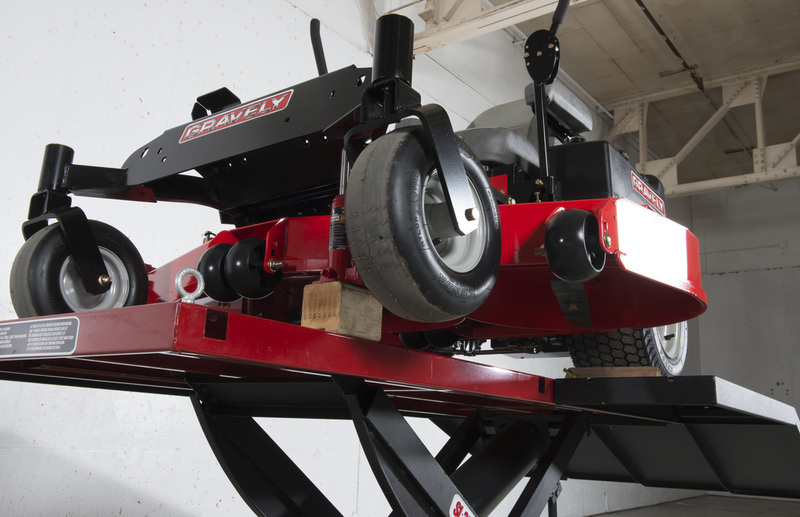 The design allows your service tech to access hard to reach areas, repair tires & brakes, change oils, hydraulic fluids, and coolants, and reach those difficult areas like mower blades on your zero turn mowers. Our SL-30W provides you with a solid 90" long x 60" wide platform for large utility vehicles, zero turn mowers, ATV's, UTV's, Golf Carts, and more. 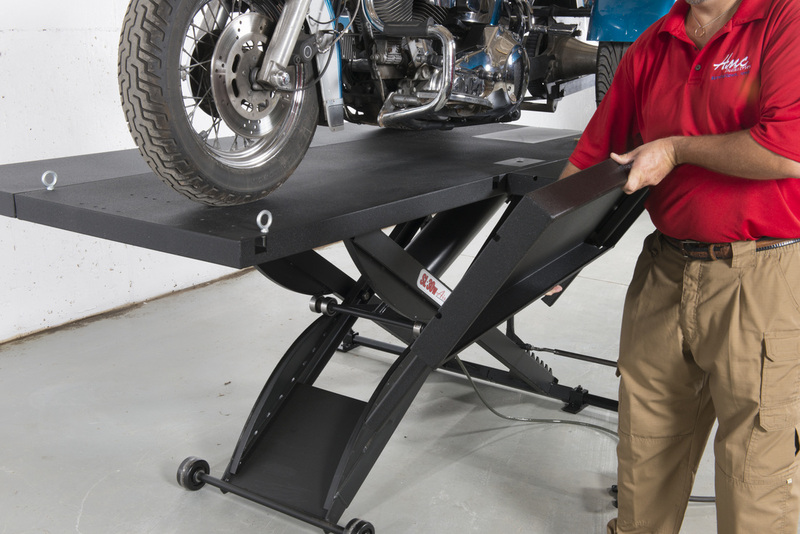 Consumers love to use the SL-30W air lift for their big bagger motorcycles as it gives them plenty of room to put their feet down on the lift. The Sky is truly the limit when it comes to the next BIG project HMC has in the works. But we can gaurantee you this; Whatever we build it will set another new standard in the industry, it will be designed for the user in mind, it will have incredible quality, and it will be backed by the best ethical service and support Americans can provide! We appreciate your business and any ideas you may have to make your work easier!